Eating ice cream while drinking beer is always a good idea, which is surprising because the last thing I crave when I’m neck deep into some beer is dairy. And yet, give me a good scoop of chocolate side by side with a hoppy IPA and I’m in heaven. It’s an odd pairing (like when Madonna and Sean Penn were together), but it’s undeniably good (anyone else miss the days when Madonna and Sean Penn were together?). 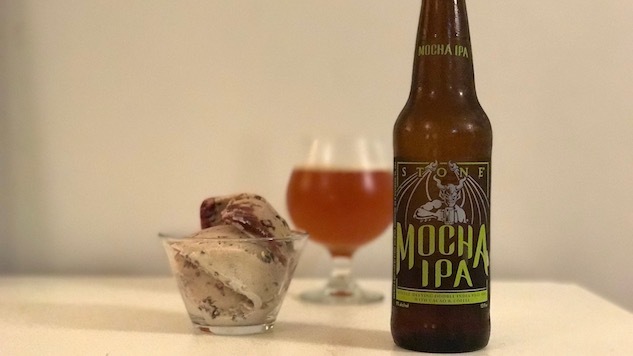 Jeni’s Splendid Ice Creams understands the power of the ice cream/beer duo so much so that they’ve created an ice cream based on a specific beer—Stone Brewing Co.’s Mocha IPA. The flavor masterminds at Jeni’s used Stone’s IPA (which has some odd flavor combos all on its own) guide their hands to create Mocha Black Cherry Ice Cream. Jeni’s sent us some ice cream and Stone sent us some beer, so we decided to knock back both in the same sitting. The result was delicious. The ice cream is heavy on the mocha, like I just swung through a Starbucks drive-thru in 1999, but really works well when you get a solid lacing of the cherry syrup onto the spoon to help balance out all that chocolate and coffee. Stone’s Mocha IPA delivers on the name. It’s an imperial IPA (9%) brewed with cacao, coffee and milk sugar. Think of it as an IPA with a stout soul. It’s creamy and delicate, but has all this fruity hoppiness around the edges thanks to the Cascade, Citra and Amarillo hops. Damn I love Stone’s IPAs. They can do no wrong in my book. Combine the ice cream with the beer and you have the makings of one of the best dinners you’ll ever have. Of course, Jeni’s and Stone weren’t the first to come up with this whole ice cream/beer combo thing. New Belgium has had a love affair with Ben and Jerry’s for a couple of years now, putting out ice cream-inspired beer and beer inspired ice-cream at a steady clip. Meanwhile, Frozen Pints is a company that is dedicated entirely to the art of beer-flavored ice cream. Hell, even Yuengling’s has an ice cream: Butterbeer. So, because it’s summer and because beer and ice cream are incredible bedfellows, we’ve come up with a few different beer float recipes for you to try at home. Dinner is served. You know you were gonna put an orange slice in that hefeweizen anyway, so why not cut straight to the chase and drop a scoop of orange sherbert in there. You’ll play up the fruitiness of the beer while cutting away some of the crisp edges in the process. I know, this combo is so obvious but sometimes the obvious pairings work out the best, like when two really, really good looking people get together and make really, really good looking babies. This is one of those situations. If you’re looking for suggestions for a particular stout, try picking one from our massive ranking of the best 144 barrel aged imperial stouts. Fact: IPAs are the best beers in the world. Fact: Salted caramel is the best flavor of ice cream in the world. That’s science. You cannot dispute it. Everything else is just fake news. Put these two beautiful things together in the same glass and you get at peak at new dimensions where sweet, salty goodness walks hand in hand with citrus-heavy hops.